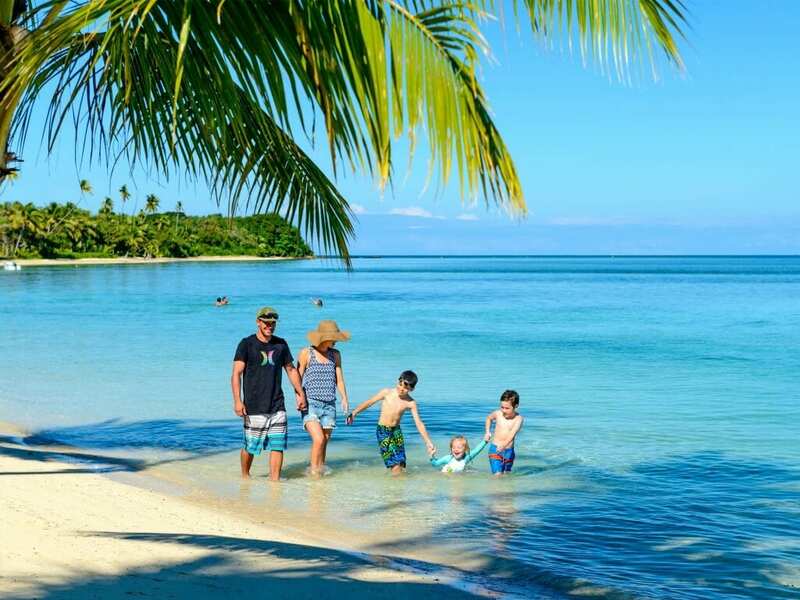 Sandy beaches, palm trees, a chilled island vibe and caring nannies – it’s little wonder families flock to Fiji with kids. Most come to stop and flop. But Fiji has more to offer than lazing on a sun-drenched beach. Adventurous families will find river safaris, zip lining, great surfing and some of the best diving and snorkelling in the Pacific. A cruise around the islands is possibly the best way to experience the beauty and culture of Fiji. Nadi and Denerau have family-friendly accommodation close to the airport. Use this as a starting point for further explorations of the islands. 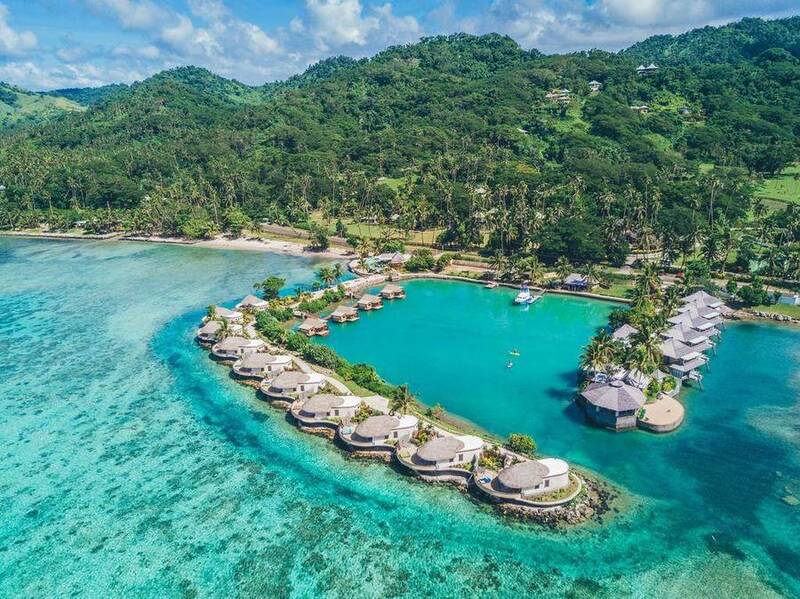 Families looking to get closer to nature may prefer the sprawling resorts dotted close to the pristine beaches and rich rainforests of Fiji’s Coral Coast. 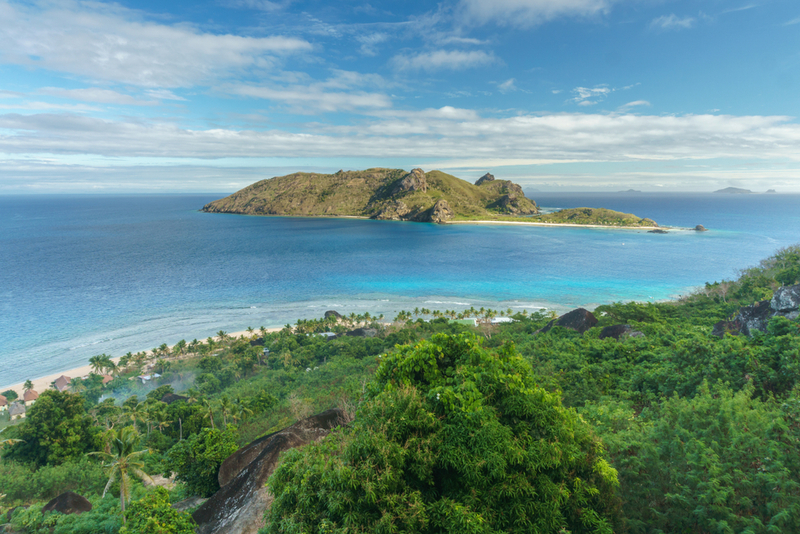 If you want a more culturally immersive holiday head even further afield to the equally fabulous resorts located amongst the untouched beauty of The Mamanuca Islands or Yasawa Islands. These two perfect strings of tiny islands that are so breathtaking they’ve provided the location for Hollywood movies. Denarau Island, off the main Island of Viti Levu, is the largest integrated resort in the South Pacific and ideal for families with younger children. It is easily acceisble, just 20 minutes’ drive from Nadi International Airport. Denerau boasts eight luxurious resorts, enormous swimming pools, safe swimming beaches and restaurants with kid’s menus and children’s tables. The vast majority of resorts offer free Kids Clubs. 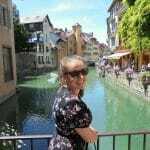 Many also offer Fijian babysitters and or nanny services for kids under four at bargain rates, and children really respond to the warm Fijian people. This option for younger children means mum and dad can take advantage of the great range of activities on offer in and around the resort. The nearby town of Nadi with its colourful sari and jewellery shops, fresh food markets and intricate Hindu temple is especially worth exploring, with or without the kids. 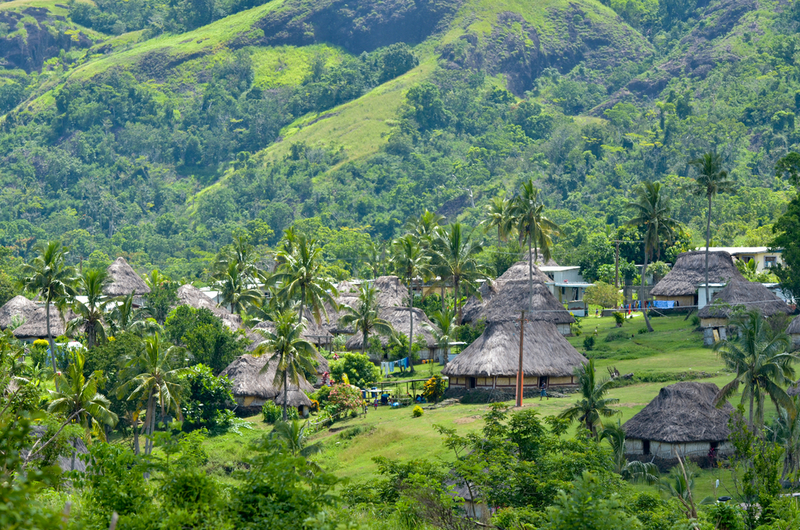 The pretty beaches and lush rainforests of Fiji’s Coral Coast are some of the best to be found on Viti Levu. This region is a great holiday base for young families. The Coral Coast has plenty of fantastic family resorts. Most have incredible kids’ facilities and activity-packed kids’ clubs. Outside the resorts, families can explore enormous limestone caves. Grab a snorkel and head to the kid-safe lagoon or any one of the spectacular coral reefs. 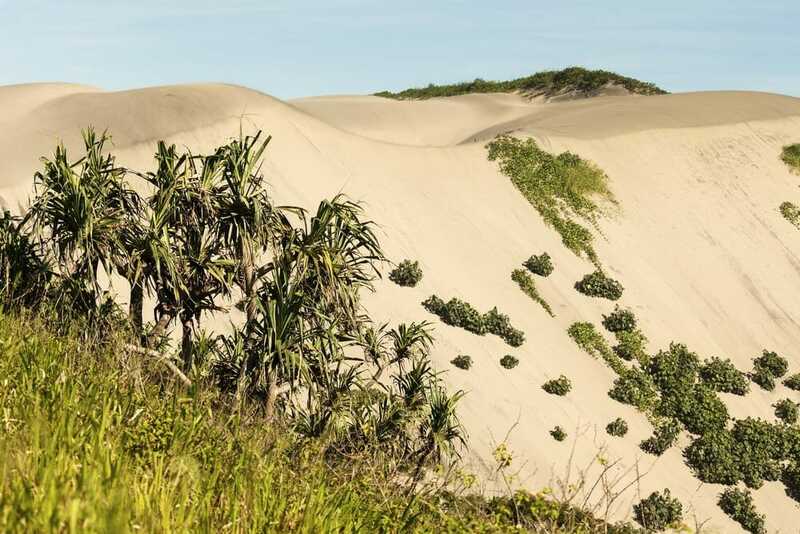 Or try sand surfing on the incredible dunes at Sigatoka. 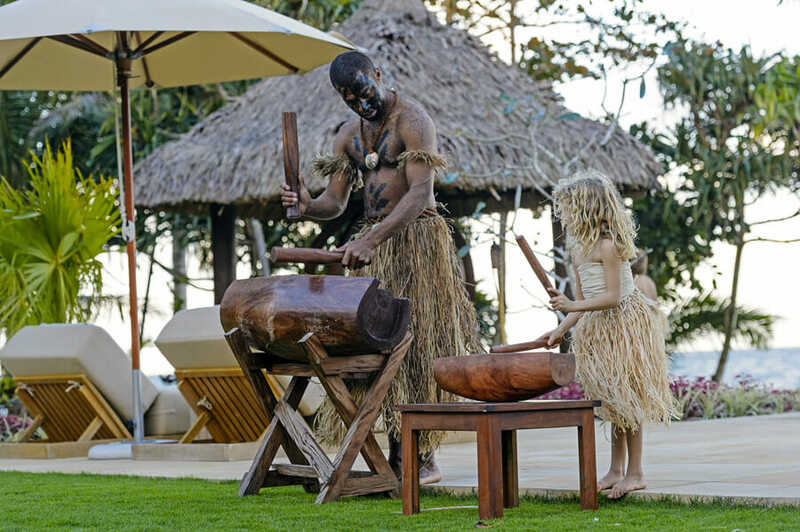 Immerse yourself in the real Fiji at the many villages in the area and observe local customs and rituals or just play with the resident kids. The Yasawa Islands are renowned for their white sand beaches, rugged landscape and pretty underwater coral gardens. Expect to find tiny islets that can be traversed in a couple of minutes and vast islands that would take days to circumnavigate. As well as snorkelling and kayaking, the Yasawas are a great destination for island hopping by chartered sailboat. But one of the best, and most fun, ways to explore the islands is from aboard one of the small family-friendly cruise ships. Catering extremely well for families, cruises take in a different island every day. Shore excursions include visits to remote villages and schools as well as swimming, fishing and campfire barbeques. The limestone caves of Sawa-i-lau in the northern part of the group also make for a very popular day trip for families. 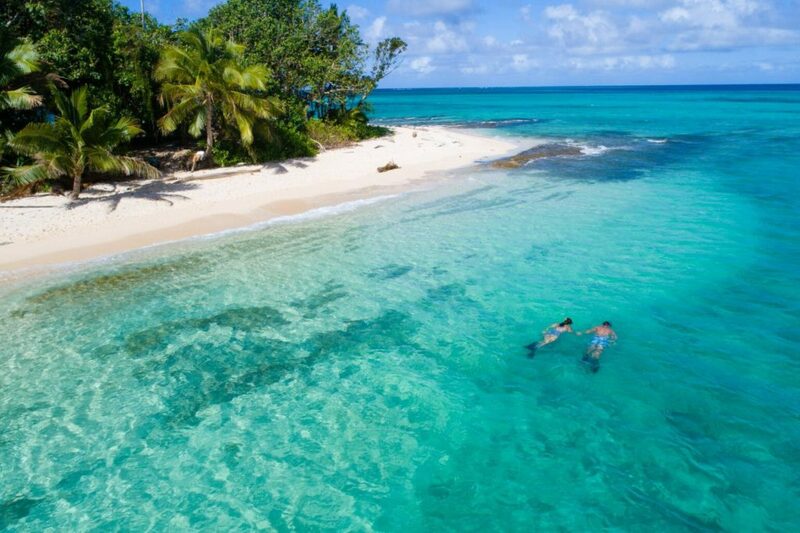 One of Fiji’s most popular destinations for both day-trippers and holidaymakers alike, the Mamanuca Islands are located just off the coast of Denerau, with ferry trips and tours taking place daily. The Mamanuca’s offer a bounty of great beaches, fantastic surf, and brilliant family resorts to suit every budget. The volcanic archipelago of 20 glorious, white sand, palm-fringed islands are surrounded by a massive lagoon. The resort islands boast brilliant pools, snorkelling equipment and kayaks to keep young ones occupied. The lagoon is filled with crystal clear water, loads of marine life and easily accessible coral reefs. From parasailing, windsurfing, jet skiing, underwater scooters, dolphin-watching, world-class dive sites and just about any other activity you can imagine doing on or under the water, the Mamanuca Islands are a fantastic holiday alternative for families with active, easily bored teens. Fiji is blessed with warm temperatures year round. But the best time to visit is during the dry season, from early May to October. At this time rainfall at its lowest. Temperatures are milder and the humidity not as stifling. November through to March can be hot and humid and, as it’s the wet season, higher rainfalls are to be expected. The wet season also brings with it an increased risk of tropical cyclones and outbreaks of dengue fever. But, depending on what kind of holiday you are after, there are other factors, including pricing and crowds, to take into consideration before deciding the best time for your family. July to August is the busiest period, along with late December and January due to the Australian and New Zealand school holidays. Prices will be higher and resorts busier during these times. 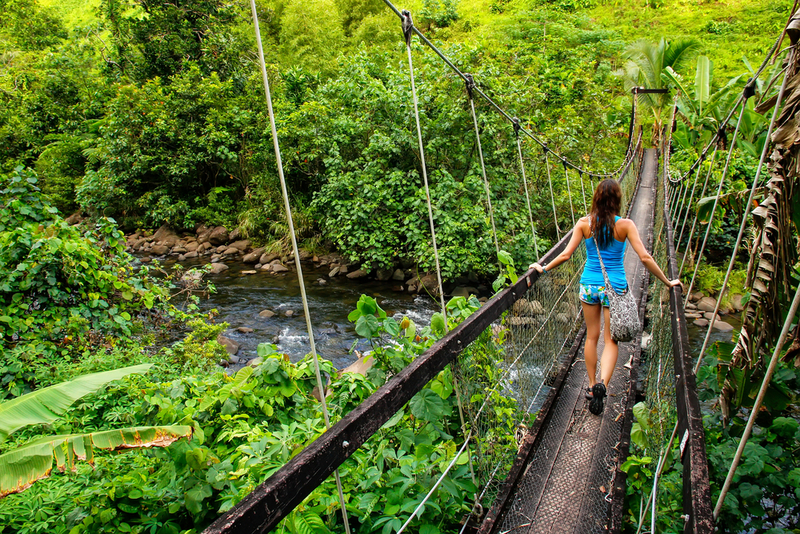 Getting around Fiji is relatively easy and cheap. Island transfers are generally included in resort bookings. The main islands have an extensive and reliable network of airlines, ferries, and buses, and taxis are also easy to find. Local buses are cheap and plentiful but if you’d rather meet the locals try the faster, but similarly priced, tarpaulin-covered small trucks with passenger seating (known as carriers) that run trips between Nadi and Suva. If you’d rather do it yourself, rental cars are widely available in Fiji however only some provide child seats, so be sure to check when you are booking. Fiji does not have malaria but Dengue Fever can be a risk if proper precautions are not taken. Zika Virus is currently not a public health threat but families should pack child-safe insect repellent (with no more than a 20 per cent concentration of DEET). For the most up-to-date information, visit the Ministry of Health website. 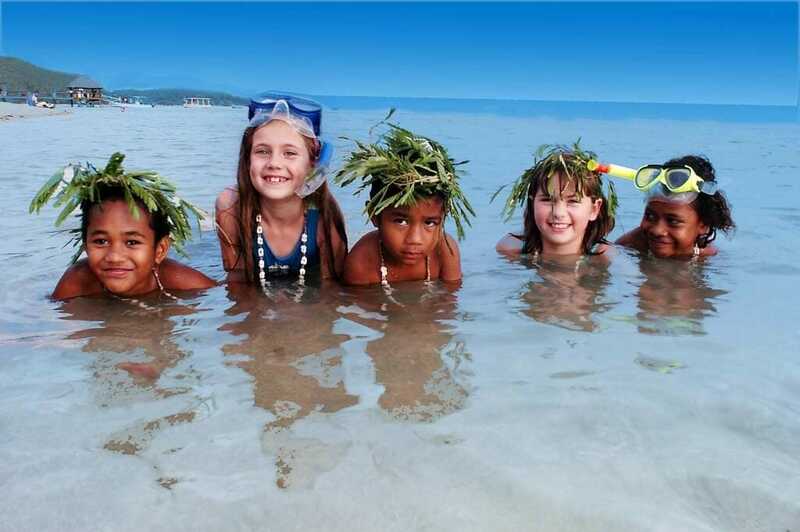 Smartraveller doesn’t list specific immunisations required for travel in Fiji but we recommend children be up to date with standard childhood immunisations before travelling, and you check the Smartraveller website before you go for any recent updates. Water in Fiji is generally safe at resorts. However, we advise drinking bottled water with an intact safety seal to avoid the risk of stomach upsets. Care should also be taken with food. Thoroughly cooked food is safe, but not if it has cooled or been reheated. Fiji’s medical facilities are good but smaller and not necessarily comparable with those of more developed countries. Doctors operate in private practice and hospitals and pharmacies are available and accessible in major towns. Many resorts also have an on-site nurse and/or doctor on call in case of emergencies. Fijian wooden carvings make great conversation pieces. Many feature turtle designs due to the important symbolism of the animal in Fijian culture. But make sure any wooden items are treated or they may not be allowed back into Australia. Kids will love Fiji’s dramatic Mako masks, hand-carved masks representing ancient island deities. Decorative Lali drums, made from a hollowed wooden log and beaten with another stick, are popular take-home items with musical kids. Tapa paintings, painted on cloth made from the bark of the mulberry tree are a beautiful reminder of the island art. Sulus (brightly patterned cotton sarongs) and Bula Shirts (the Fijian incarnation of Hawaii’s floral shirt) can make for a colourful reminder of your Fijian holiday. Fiji is better known for its beautiful beaches than its food, but the islands’ wealth of fresh produce, combined with multicultural influences, make for a healthy and tasty local cuisine. 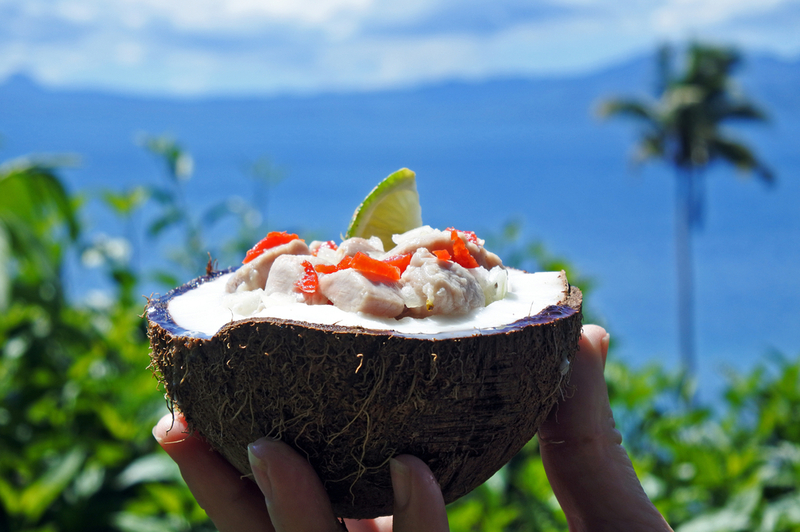 Root crops, including sweet potatoes, taro and cassava, coconut and fresh seafood form the basis of Fijian cuisine. Food is traditionally prepared over an open fire or in an underground pit (lovo). Reef fish, mussels, crab and lobster are frequently consumed but other meats are less common, with the exception of slow-cooked pig, which is prepared for special occasions. Food is heavily influenced by the Indo-Fijian culture with colourful curries and spices adding a flavour packed element to dishes. Western food and children’s menus are readily available in resorts for fussy eaters. For those families with more adventurous palates, must-try dishes include the marinated meats of the lovo and kokoda, a dish of fresh fish marinated in lemon juice and coconut cream with diced tomatoes, spring onions and chillies. Most Fijians are religious and quite modest, and it is important for all members of the family to be respectful by dressing accordingly. 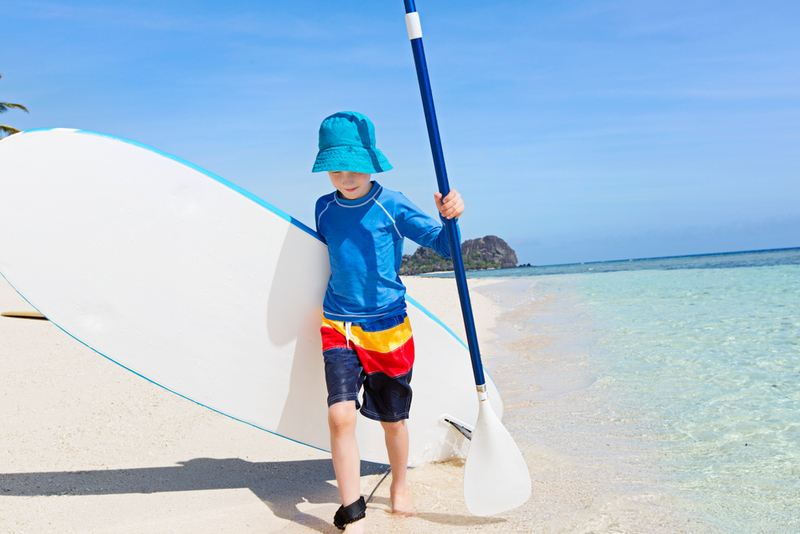 Save beachwear for the beach and keep shoulders and knees covered when visiting villages. Fijians are amongst the friendliest people on earth and it is not uncommon to be invited into their homes. They are also unfailingly polite so should you accept such an invitation be gracious, remove hats and shoes before entering and always thank your host. The drinking of kava is one of Fiji’s best known social rituals and an essential experience for adults, but it is not appropriate for children to partake due to its numbing side effects. The Fijians are big hand shakers but never touch someone’s head – including children – as it is considered bad manners and it is important to always ask permission before taking photographs of local people. Fiji can be an affordable destination with accommodation to suit all budgets. 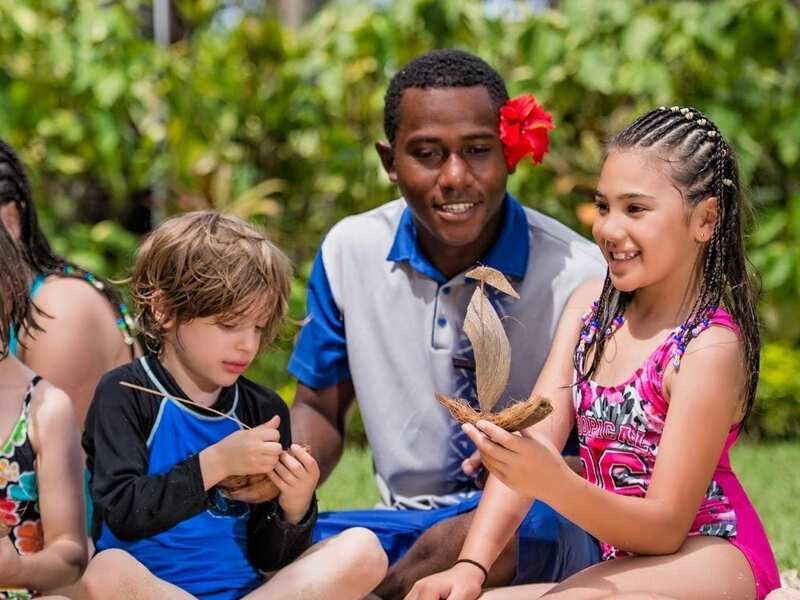 The best value for families is to book into one of the many all-inclusive resorts, some even provide free accommodation and meals for kids travelling with paying adults. Inflation is relatively high so expect prices for dining out, clothing and souvenirs to be similar to those in Australia. Visitors need to be aware of price hikes during peak season with costs increasing as much as 20 per cent in June and July. Food and drinks are somewhat cheaper on the main island of Viti Levu than on the islands, but you can always pick up fresh and tasty bargains at roadside snack stands. Souvenirs are cheaper to purchase in local markets, but stalls holders can be pushy so stand firm if you don’t want to make a purchase. It is also worth noting that tipping is not expected or encouraged in Fiji, but is always appreciated.